Your Dirt Hauling Permit and SWPPP (Stormwater Pollution Prevention Plan) will most likely require a street sweeper on site for the duration of your dirt haul. Not having one can subject you to violations and cause problems with your inspector. “A minimum of two(2) FULL SIZE broom pick-up sweepers shall be in operation at all times and additional sweepers may be required by Public Works Inspector. 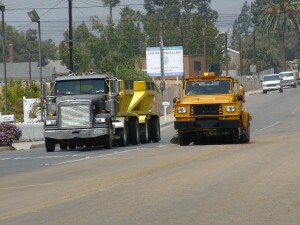 Sweepers must be on the job site Prior to beginning dirt hauling operations. Sweeping MUST continue (1) hour minimum after hauling has stopped for the day. Don’t wait until the last minute or until you get “caught” by a city inspector. Order early and get a sweeper that not only shows up, but has all the warning lights and dust control systems needed for this type of work. Ordering a sweeper from them was quick and easy. They were on the job an hour after my initial phone call. Bill’s Sweeping Service always helps us out with our street and garage sweeps. They always do a professional job, and even manage to help us out on short notice requests. Bill’s Sweeping has been great to work with. They are proactive with their maintenance program and always deliver what and when they say. They have been my “go to” for street and lot sweeping the last few years. Not only do they always make time for us with little notice but Rachel and Debbie are always willing to do what it takes to get us on the board so that our job sites and customers are happy. They get it done. In the fast paced concrete industry, we often have daily schedule changes, but the representatives of Bill’s Street Sweeping always find a way to service and adjust Guy Yocom Construction’s Street Sweeping needs. Thank you for being a great team member! John McCawleyProject EngineerGUY YOCOM CONSTRUCTION, INC.